Darn, Darn, and Darn again! I am going to have to quit teaching and just work with only books because it is so easy for them to get away from you with all the other responsibilities of teaching. Had I seen these beautiful picture books a couple weeks ago, I could have nominated them for a Cybils. But alas, I did not. So I will talk about them here in hopes that others will look at them as well. I guess you could say I had some themes going on in my head when I picked up these books, but actually I just grabbed them, didn't really pay attention. But, they are all wonderful historical books. The BEST! The best of the three books I read! I cannot even believe this story came from the author finding thousands of paper-traced feet in her grandmother's attic. 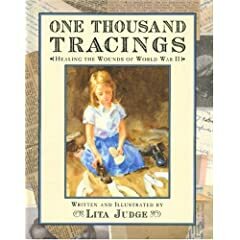 The book tells the story of a young girl and her mother who tirelessly search for shoes (and other necessities) needed by families in post World War II Europe. The story is so touching and is only enhanced by its wonderful illustrations, some of which are actual photos of artifacts either found in the attic or representative of the things that would have been sent to families. There is so much more behind the scenes of this book, so make sure you read the Author's Note. I know what you might be thinking, "Another Jackie Robinson book?" but this one is quite special. The illustrations look just like real photographs! (The pictures are actually oil on canvas.) 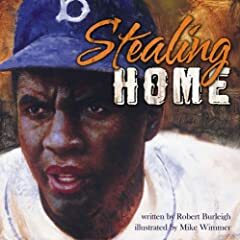 On each page of the book there is a verse about Jackie Robinson stealing home plate, but what really makes it different is there is also box made to look like an antique baseball card which tells an account or factual aspect of Jackie Robinson's life. I did however, have to read the verse and go back to the cards because it was too hard to read all at once. ~ I am a little too tired to do any links to other reviews tonight, so I may come back and do that later. My apologies. i gave Henry's Freedom Box to my teacher partner for her b-day last year. such a lovely, lovely, book. nice recs. Yes, Amy I agree, lovely.